This is a very brief overview of the Norse of the Viking Age, prepared to act as a guide for Elementary level teachers (1993). Although very general in nature (!) it does cover the main topic areas : daily life, ships and travel, trade and warfare, religion. A short annotated list of books suggested to be helpful for basic research or in a class room situation. Prepared to accompany the Teacher's Guide. 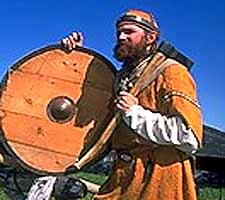 This is a short introduction to the Norse and the Viking Age that was written to accompany the presentation of this exhibit at the Woodstock Museum in 2000. 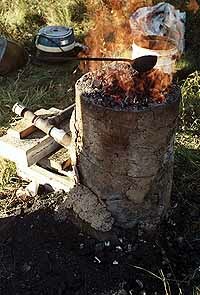 As well as work directly related to the Encampment series itself, work has been undertaken in a number of related projects. 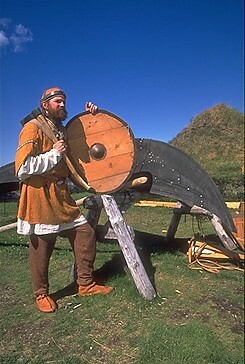 During and after the 'Viking Millennium Year' of 2000, educational programming was designed related to a number of major exhibits. For both Vikings - North Atlantic Saga (Smithsonian) and Full Circle, First Contact, consulting was done on the included educational packages, as well as training sessions for staff at a number of hosting institutions. The World of the Norse was a 1000 square foot 'room setting' style exhibit created for the Cranbrook Institute of Science. Here replica objects were placed in 'living' context (something often lacking in more conventional 'artifact' based exhibits). Expect additions to the series of resources for teachers presented here, as individual working notes are translated for web based use.